The government has made provision for both basic education, and further education, in the South African Constitution. The key words in that statement being ‘through reasonable measures’ and ‘progressively available and accessible’. What constitutes a ‘reasonable measure’? How does one make tertiary education ‘progressively available and accessible’ to everyone? Many solutions have been presented, but so far, it seems, few that are viable or sustainable in the long term. The Constitution itself puts a constraint on it: The solution to the problem must be reasonable and progressive. In other words, it must be of sound judgment, based on good sense, be fair and logical. And, in order to make sure that it works and is beneficial to everyone, it must be taken on in a gradual, systematic way. That way, if adjustments need to be considered and processes reworked, it can be done in such a way that the progress that has already been made is not lost. Having the education system open and accessible is also only half the battle. The ultimate goal is an education system of the highest quality, acknowledged as such on the global stage. As much as we desperately want it to be done immediately and overnight, taking on the Goliath that is accessible and available, quality education for all South Africans – both at basic and further education levels - should not, in good conscience, be taken on all at once. Two of the biggest problems facing us on this front are occupations in high demand (OHD) and a part of the population known as the ‘missing middle’. On one hand you have occupations and careers that our economy and infrastructure are in desperate need of – teachers, doctors, engineers, accountants, positions in agriculture, pharmaceuticals, construction, entrepreneurs and business people with skills in sales, marketing and management. On the other you have a large section of the population deemed too wealthy to receive financial assistance from the government, but still too impoverished to be able to afford paying their own way at the tertiary education level. For many students in this category, parents and guardians have to almost commit financial suicide in the form of loans, just so that their children can have a chance at what is stated as their constitutional right. This, of course, puts even more strain on this income bracket, with many students dropping out of the system due to inadequate resources and a non-existent support system. But, should this be a problem solely for the government to solve? Should we, as citizens, not step forward, roll up our sleeves and get to work in making this dream, set out in our constitution as a fundamental human right, a reality? Because, an education might be our right, but with that right comes responsibilities. 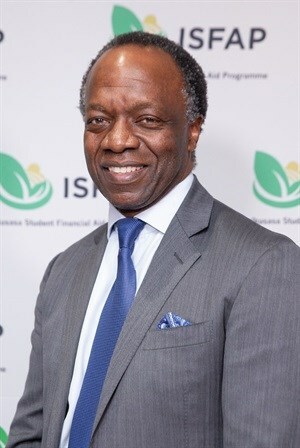 To this end, the Ikusasa Student Financial Aid Programme (ISFAP), in conjunction with the private sector, has taken up the challenge: To provide, not only the needed financial support to these students, but a gravely needed support system that tackles everything from daily expenses to medical and emotional support. Not only is ISFAP opening the doors to these institutions for students who would not ordinarily have this opportunity, but with our wrap-around funding model, ISFAP is also making sure these students are able to stay the course. Thereby bringing our leaders’ dreams of education for all one step closer to reality.